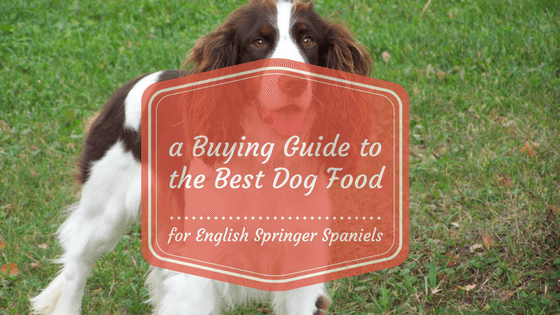 We have ploughed through many dry dog food brands from premium to veterinary recommended, read the reviews and compiled the research to give you the best foods based on your Springer Spaniel's dietary requirements. Read our analysis and in-depth reviews of the top 4 rated English Springer Spaniel dog food. For such an active dog like the English Spaniel, simple food is not enough. They need a combination of nutrients that will provide plenty of energy, and will maintain their bones, joints and coat in perfect condition. The Solid Gold Holistic High Protein with Red Meat and Buffalo formula is high in protein (38%), healthy fats and calories and contains 16 superfoods. Since grains and gluten are well known to cause allergies and digestive problems in dogs, this formula does not contain any of them (i.e gluten and grain-free). Instead, it is packed with high quality proteins and wholesome ingredients including fish, red meat, fruits, grasses and legumes. The addition of ocean fish meal and flaxseed will provide the necessary amount of fatty acids, nutrients that ensure healthy bones and coat. The vitamins and minerals come from natural sources like pumpkins, carrots, blueberries and broccoli, so your Spaniel won't require any additional supplements. What stands out about this formula however is how well dogs with stomach or digestive problems do on it. They thrive on it! 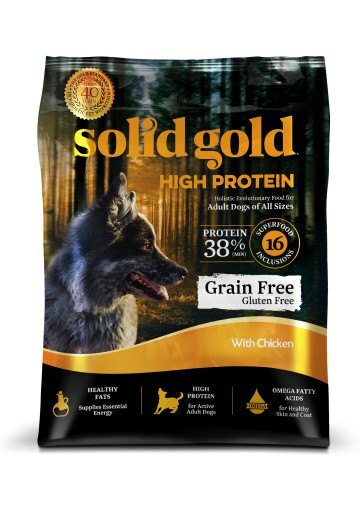 All of Solid Gold's formulas are produced in the US with great human-grade hypoallergenic variety receiving between four and five star ratings on the well-known DogFoodAdvisor.com website. You can trust Solid Gold in producing premium quality dog foods which is why dog owners including myself love this brand and keep coming back for more. Overall, Solid Gold is a well priced and great first choice of dog food for an active English Springer Spaniel adult dog. High quality proteins and healthy fats. First 5 ingredients: Beef, Beef Meal, Peas, Pea Protein and Chicken Fat. A very highly regarded premium brand and if you have the budget to spend a little more, this really is another comparatively good choice for your Spaniel. The Orijen Dog Food formula offers a very rich and varied diet covering all the nutrients your dog will need from protein to carbs, vitamins and minerals. It is free from grains and is an all life stages formula suitable for puppies, adult and senior dogs. This diet is made up of 85% meats which is a mix of poultry and fish and the remaining 15% is made up of vegetables, fruits and botanicals. Because it contains the right balance of nutrients (low fats, high proteins, low carbs) it is especially great for weight control. Similarly, this formula has no fillers, unwanted preservatives or unneeded ingredients which Springers with allergies or an upset stomach will appreciate. The English Springer Spaniel has a long coat that takes a lot of grooming and special attention, but thanks to the vitamins and minerals that are found in this formula your Springer may not need that extra supplement to maintain their beautiful coat. It addition it also contains both Prebiotics and Probiotics friendly bacteria which aids in digestion. This food is regularly recommended in the top 10 rated dog foods list because it is reliable in using human grade ingredients, it is compiled with the help of animal nutritionists and while pricier than other brands it is a wise investment into your Springer Spaniel's health. Lots of good proteins and a lot fewer carbs. First 5 ingredients: Fresh chicken meat (13%), fresh turkey meat (7%), fresh whole eggs (7%), fresh chicken liver (6%), fresh whole herring (6%). We often recommend Wellness being a reliable holistic brand of premium dog food with a wide range and variety to choose from at very competitive prices. For most if not all dogs, a diet rich in grains and carbohydrates is not recommended, as it lacks the nutrients which will see your dog living a long and a healthy life. A high protein diet is the key to healthy nutrition, and that is why Wellness Core is an excellent option for any Springer. The proteins in this formula come from first-class meat such as chicken and turkey which provides the taste that dogs love. This grain-free formula carefully provides a balanced level of protein, fat, calories, mineral and vitamins that supports your dog's health. Herbs, grasses, fruits and legumes provide the much essential micro-nutrients and antioxidants. The Wellness Core food is free of any artificial ingredients such as preservatives, colors and flavors. It is also soy, wheat, fillers and corn-free, so dogs with a sensitive stomach or bloating issues will have no problem digesting it. In addition it contains Glucosamine and Chondroitin to support healthy joints. 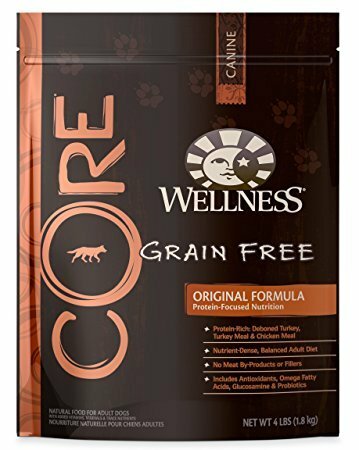 Wellness Core Original Turkey and Chicken Formula Dog Food is made in the USA and is formulated to meet the nutritional levels established by the AAFCO Dog Food Nutrient Profiles for maintenance. Overall, this food is highly recommended and your English Springer Spaniel should thrive on it. High quality and healthy food. First 5 ingredients: Deboned Turkey, Turkey Meal, Chicken Meal, Peas and Potatoes. I have selected an additive-free diet formula particularly good for your Spaniel puppy especially since this breed is well-known for its hyperactivity and sensitive tummies. And one of the healthiest and trusted brands when it comes to hypoallergenic foods is the Honest Kitchen. 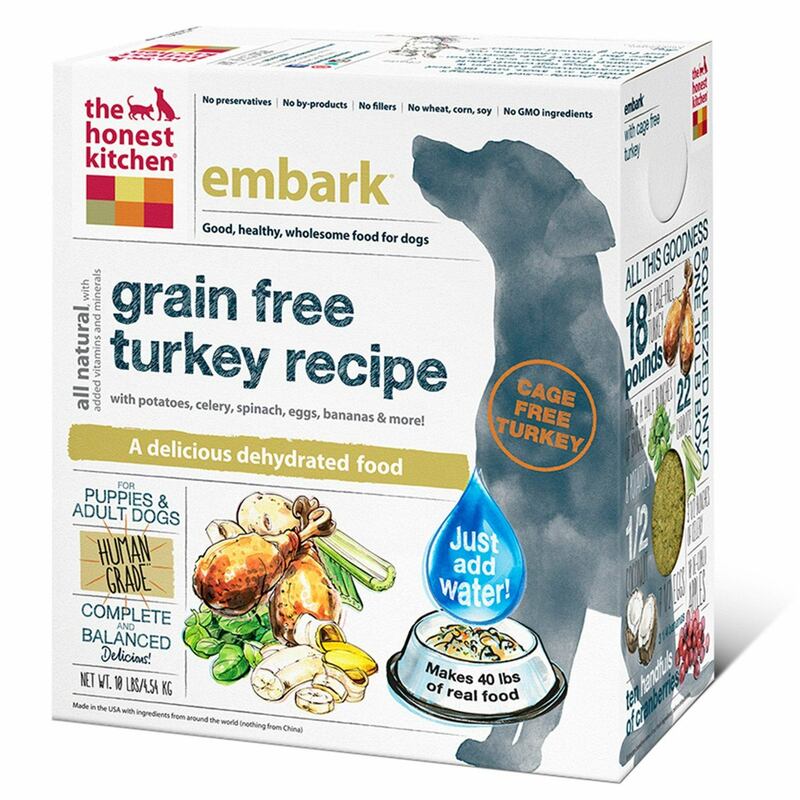 The Embark Grain Free Turkey Dog Food formula is grain and gluten free and is made with free-range turkey fit for human consumption. It is high in protein and calories which is what you are looking for in a diet suitable for a growing and active puppy. It is made up of dehydrated whole food ingredients (nutrients haven't been stripped off when processed) and you just have to add hot water to have it prepared and served for your pupster. The ingredients are very impressive from spinach and carrots to coconut and eggs as well as vitamins and minerals to ensure you get a complete and balanced diet for your English Springer Spaniel pup. This formula is AAFCO complete and balanced for all life stages and breeds. If you are concerned about the quality of the food you are giving your puppy this food is at the top and is definitely worth a try. Good enough for humans, too! First 5 ingredients: Turkey, organic flaxseed, potatoes, celery and spinach. Cheerful, loyal, social, lively, obedient, and friendly toward strangers. However, they sometimes suffer from Rage Syndrome which makes a healthy diet important for maintaining their mood. Active breed that can adapt to different living styles. They do well with families and singles, apartments and larger homes. Well-known for being hunting and retrieval dogs, Spaniels love the outdoors. We recommend feeding your Springer Spaniel a diet consisting of high protein, moderately high fats and a limited amount of carbohydrates. A puppy and active spaniel adult will require a higher calorie dog food than a senior dog to compensate for the reduction in their activity levels. Calories for an inactive Springer Spaniel adult should be kept under a 1000 a day to avoid obesity while the more active dogs should be on a daily calorie diet of around 1300. Springer Spaniels are most likely to suffer from: joint problems like Canine Hip Dysplasia, allergies and immune diseases, Elbow Dysplasia, Epilepsy, Seborrhoea, some risk of bloat and Fucosidosis. English Springer Spaniels can be easily overfed leading to obesity and food sensitivities are also quite common in this breed. Some of those health issues can be corrected if they are fed on the right diet of quality proteins and fats. We go in more detail about those health concerns and how some can be addressed with the right food. Now that you know what each food brand has to offer, it is up to you to choose which food will best suit your Spaniel. All commercial dog food is regulated by the Association of American Feed Control Officials (AAFCO) and in general dog foods labeled "complete and balanced" contain the proper balance of nutrients for your dog. We have reviewed dry kibble since we know how much Spaniels love to chew. The following information is a helping guide related to Spaniel nutrition which is beneficial to know when researching what to look for when shopping for your Spaniel's food. What foods should I feed my Springer Spaniel? Since this breed has a lot of energy and is capable of a lot of exercise, English Springer Spaniels should be fed a diet that includes some meat and natural, whole foods like vegetables. It is important to watch your English Springer Spaniels’ weight because it can spark some common health issues. Either canned or dry commercial dog foods will contain the required nutrition however please note that canned foods often contain up to 70% water so careful analysis of their ingredient list is a must! I generally prefer to use dry kibble since it also helps to keep teeth clean and gums healthy and generally contains only about 10% water. How can you determine what is a good food brand? Well, the first ingredient in the food should be a name meat or fish source. Second, look for recognizable whole food ingredients like salmon, sage or blueberries, instead of salmon, propylene glycol or ascorbic acid. Look for foods that contain meats (chicken or salmon) instead of fillers and grains (corn or wheat). Finally avoid byproducts as these are low digestible ingredients. However, most dogs should be eating foods that contain significantly more protein than the minimum currently put forth by AAFCO. A good guideline to go by and is what veterinarian nutritionists recommend is that the sum of protein and fat should be +45% and limited carbs. 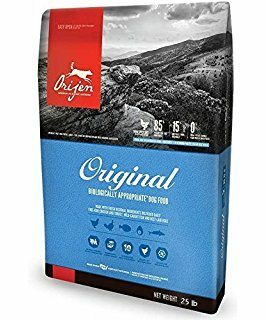 A few substantial pet food brands that are vet recommended are Orijen, Wellness, Solid Gold, Taste of the Wild, Wellness, Zignature and Buffalo Blue. These are grain free options that don’t use fillers, meat by-products, preservatives and other harmful ingredients that are found in some dog kibbles. High quality dog food will give an English Springer Spaniel the energy it needs for a healthy, happy, active outdoor life with its owners. If you are feeding a senior Spaniel dog, veterinary nutritionists recommend a high protein kibble since they require more protein as they age which is also correlated with longevity in dogs. How often should I feed my English Springer Spaniel? Every dog is different, and your feeding regimen will reflect your dog’s size, age, breed, activity levels, and other important factors. Generally, owners should feed an English Springer Spaniel puppy two or three times daily until they are six months old. Adult English Springer Spaniels should be fed once or twice per day. As a dog gets older and its energy levels decrease, owners usually need to feed a little less to help maintain a healthy weight. Owners can choose to feed their English Springer Spaniel only dry food or a mix of dry and wet, but the important part is choosing quality food with responsibly sourced ingredients. Keeping an English Springer Spaniel on a good diet is key to having them live a long life and fight common illnesses in this breed. How much food should I feed my Spaniel to avoid overfeeding? When feeding an English Springer Spaniel, owners should generally follow the guidelines on the dog food they buy, taking into account their pet’s weight. Owners can always choose to adjust later based on how satisfied their pet is and whether their activity levels are higher than other dogs. According to the National Research Council of the National Academies inactive dogs should be fed c. 989 calories a day. An active and healthy English Springer Spaniel should eat around 1,300 calories a day. Since this breed can suffer from weight problems and joint issues, it is important to make sure you do not over feed them. An inherited skin disorder seen more often in English Springer Spaniels than some other breeds. Symptoms include an oily coat with scaly skin. Luckily, premium dog food brands always include some form of monounsaturated fats to help prevent skin conditions and promote a healthy coat. English Springer Spaniels commonly suffer from a range of food allergies and immune diseases, so feeding them healthy, grain-free dog food with antioxidants for an improved immune system can be an important way to keep these issues at bay. Epilepsy is characterized by seizures and typically treated with anticonvulsants. Unfortunately, this sometimes fatal condition is somewhat common in the English Springer Spaniel breed. Epilepsy usually presents itself from 1.5 to 3 years, but can also show up earlier or later. Early prevention is key to getting this health problem under control. A fatal metabolic disorder that can be diagnosed by blood or DNA test. Symptoms include in-coordination, loss of balance, vision and/or hearing loss, depression, and esophageal dysfunction.